During this on-demand webinar, expert speaker Judy Adams, RN, BSN, HCS-D, HCS-O, will go over the current hospice coding rules as well as the latest pertinent hospice regulatory information. 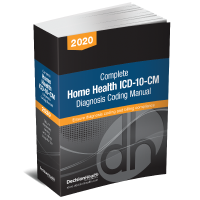 Home health coders are being asked to also code their company’s hospice cases, but to do so accurately and compliantly, there are some unique rules and regulations they must be aware of. The rules of hospice coding have changed over the last few years, making it challenging to keep up with which codes must be assigned and which codes can’t be used as the primary terminal diagnosis. During this webinar, expert speaker Judy Adams, RN, BSN, HCS-D, HCS-O, will go over the current coding rules as well as the latest pertinent hospice regulatory information. Participants will also learn how to prepare for potential future changes to ensure they remain up to date on regulations and requirements. Judy Adams, RN, BSN, HCS-D, HCS-O, AHIMA-approved ICD-10-CM trainer, is president and owner of Adams Home Care Consulting in Asheville, North Carolina. Adams has more than 35 years of clinical operations experience in the homecare and hospice settings, and has presented hundreds of educational programs on nearly all aspects of homecare. For the past 20+ years, she has provided a variety of operational and clinical consultative services to large and small homecare and hospice organizations in the eastern half of the United States and has taught hundreds of teleconferences and workshops on ICD-9 and ICD-10 diagnosis coding, OASIS, home health prospective payment system, coverage and documentation, Conditions of Participation, and other clinical and regulatory home health and hospice topics for individual agencies, state associations, and national organizations.